Many people refer to Pileated Woodpeckers as flying dinosaurs. They have a unique appearance and life history. Every species fills a unique nature niche separating it from other species. Adaptations allowing a species to survive might cause it to become extinct if its habitat changes and its needs are too specialized. 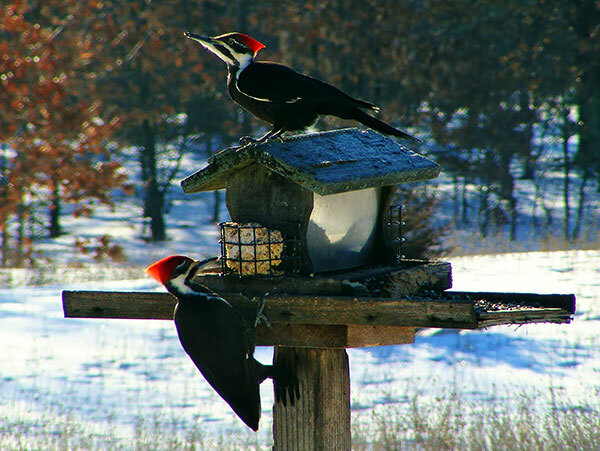 This photo shows two Pileated Woodpeckers eating at a feeder at the home of David Marin, of Nelson Township, in 2013. The male is on the lower left. 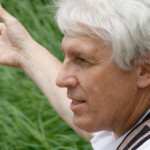 Photo by David Marin. Pileateds declined significantly in Michigan as a result of unregulated logging in the late 1800’s and early 1900’s. Trees were cut and the remaining branches were deliberately burned to clear regions. Fires spread to burn towns, kill people, and destroyed habitat that many species required. Following deforestation, areas were cleared for farming and settlement. Much of Lower Peninsula was no longer suitable for Pileated Woodpeckers and in the Upper Peninsula the species was relegated to restricted areas. Second growth forest expanded in the Upper Peninsula creating large stands of maturing forest where the bird expanded its population. Few remained in lower Michigan, Indiana, and Ohio because of deforested habitat. Southern Ohio and Indiana landscape prevented complete clearing. Pileated Woodpeckers remained more prevalent southward into Kentucky and Tennessee. For most of the past 100 years it was special to see this woodpecker between the Upper Peninsula and Southern States. Now it is quite common. They are regularly seen at Ody Brook Nature Sanctuary where adequately large habitat exists. The sanctuary is not large enough by itself to support the species. Fortunately, neighbors have allowed maturing forest to remain along Little Cedar Creek where it creates a ribbon of habitat containing essential food, water, and shelter in appropriate living space. Habitat space is critical but it does not need to be shaped in squares, rectangles, or ribbons. It needs to be large enough to contain adequate food of the correct type and shelter for nest sites. The pileated normally drills a fresh nest cavity in a tree annually and requires large trees. Minimal habitat to supply food and shelter is thought to be about 150 to 200 acres. Food includes many insects, acorns, and fruit. They feed heavily on carpenter ants by using their long sharp beak for chipping large pieces of wood from a tree. The trees are usually partially hollowed by ants. The woodpecker can hear the hollowness when it pounds its head against the tree. A solid healthier tree will not provide a smorgasbord of food inside. Trees hollowed by ants are easier to drill into. Woodpeckers have cartilage in the skull that helps absorb shock and protect the brain. When the bird creates a hole in the bark, it can reach deep into an ant tunnel with its long tongue to retrieve many ants. There are barbs on the end of the tongue to help capture prey. When not feeding, the tongue must be stored somewhere besides hanging out of the mouth. It draws it into a cavity between the skin and skull, wraps it around the back of the skull for storage until needed. I have State and Federal permits to salvage dead birds for educational use and have stuffed a pileated woodpecker. I retained the long tongue to show people its adaptation. The feet are also uniquely adapted for anchoring the bird to a tree while it works. It has a zygodactal toe on each foot. It can move its outer toe forward so it has three pointing forward or move it backward so two are forward and two back. When drilling the two backward toes provide greater grip. It uses its tail feathers that have stiff central veins to prop and hold the bird in place. This is the only woodpecker in the US to make long rectangular cavities in trees. Even without seeing the bird you can recognized the presence by cavity shape. Males have a red crest that reaches the bill. Females are gray from the bill to the top of the head. Males have a red mustache along the side of the head while females have a black one. White can be seen in the wing of this crow-sized bird when it is in flight. Enjoy seeing this increasingly common bird as forests regenerate in our region.